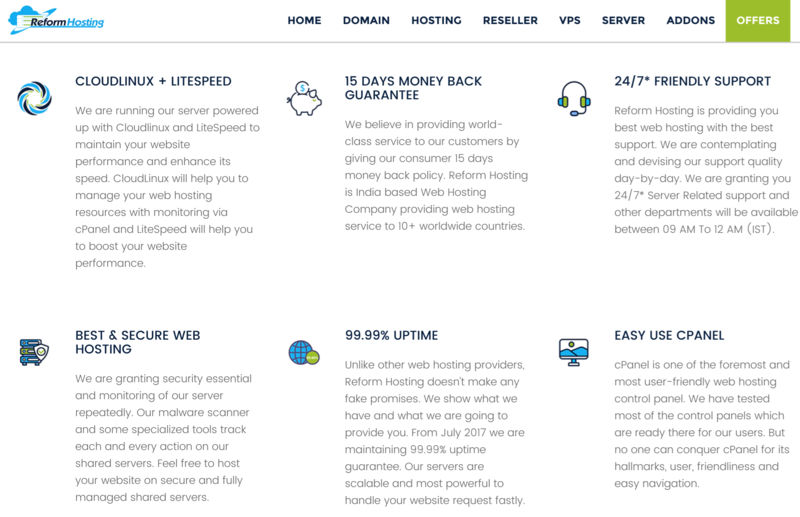 Reform Hosting Review 2019: Is Reform Hosting a Good Hosting? Indian web host Reform Hosting is based in Nanded, Maharashtra. It offers shared hosting, reseller hosting, cloud VPS, and dedicated servers along with domain solutions, SSL certificates, and web add-ons. Reform Hosting is a relatively new Indian web hosting brand that was established in 2017 in Nanded, Maharashtra. It’s registered under the company name Garvi Web and Data Centers Solution. This provider’s hosting services include Linux and Windows hosting, reseller hosting, cloud VPS, and dedicated servers. It also offers domain registration and transfer services along with SSL certificates, SiteLock security plans, and Google’s cloud-based G Suite. Reform Hosting’s website is in English, but its client area supports twenty-five additional languages. Reform Hosting’s shared hosting plans include four Linux hosting plans, four Windows hosting plans, and three business hosting plans. The company also offers reseller hosting, cloud VPS, and dedicated servers. With the entry-level ‘BASIC’ Linux plan you get to host one website with 2 GB SSD disk space, 50 GB bandwidth, and unlimited email accounts. You can opt for one of the higher STANDARD, ADVANCE or EXTREME plans for more hosted websites (2-5), more disk space (10 GB-unlimited), and unlimited data transfer. The two highest plans include a free domain when you choose a one- or two-year billing cycle. For Windows hosting with unlimited SSD storage and bandwidth, you can try one of the four plans that use Windows Server 2012 R2 and come with the Plesk control panel. On all but the BASIC plan, the Windows plans include a free domain when you commit to hosting for a year. Weebly website builder, which helps you create a website with absolutely no coding experience simply by dragging and dropping. Softaculous one-click installer with more than 100 free scripts. You can easily host Magento, WooCommerce, and more e-commerce applications with these hosting plans. CodeGuard website backup performs daily automated backups with a one-click automatic restore facility, and it safeguards your website against attacks and data loss. Thanks to its partnership with Cloudflare, Reform Hosting allows you to activate this CDN for free from within your client area. 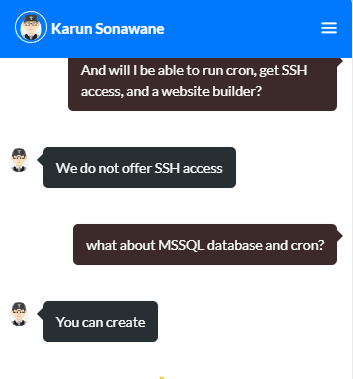 Reform Hosting’s shared hosting plans are cheap, and you can pay for them in U.S. dollars or Indian rupees using debit/credit cards, online wallets, Paytm, bank transfer, or PayPal. Available billing cycles are monthly, semi-annual, and annual. The 15-day money-back guarantee might make you feel a bit better about signing up for a longer term but the payment gateway transaction fees will be deducted from any refund you get. There is no real knowledge base to speak of unless you think that two entries will be enough for you to support yourself. If you are looking for quality hosting plans that are nothing short of steal deals, Reform Hosting should be where you’re heading. Wondering how Reform Hosting stacks up against other Web Hosting companies? Enter any other Web Hosting company and we will give you a side-by-side comparison.